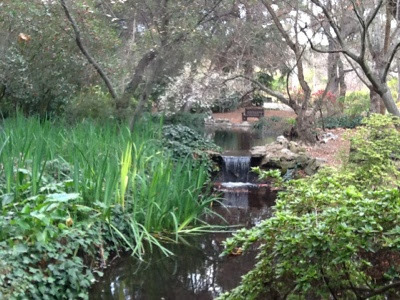 Descanso Gardens, in La Cañada Flintridge near Los Angeles is, indeed, a restful place. With its blend of shade, water features and benches all generously placed throughout this Southern California retreat, rest--or "descanso" in Spanish--comes easy. The shade is provided by a canopy of mighty Coastal Live Oak trees, whose large branches streak across the sky like lightning bolts and altogether they present as an abstract piece of art. Under this forest of trees is a woodland garden. 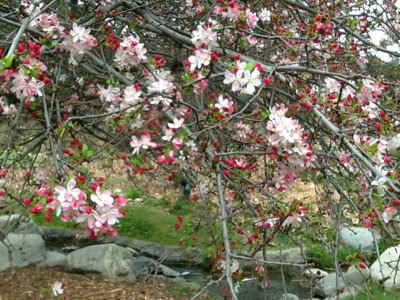 There is respite from the California sun and it is the perfect setting for thousands of camellia shrubs. 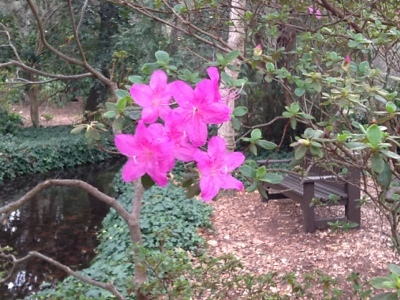 Many were blooming in February when I visited. The original owner of the property, E. Manchester Boddy, was the publisher of the Los Angeles Daily News and in 1937, he commissioned a 12,000 square foot home built on a hill and also began planting thousands of camellias. Thousands more were added to his collection since then and a sign in the garden states there are some 35,000 camellia shrubs planted here! 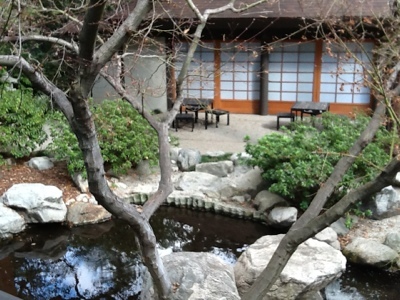 The small but tranquil Japanese garden on the property is one of at least three California gardens used to film Memoirs of a Geisha (one of my favorite books, too). Scenes of Japanese gardens with cherry and plum trees in full bloom and geisha in traditional dress made beautiful and memorable cinematographic contributions to this film. 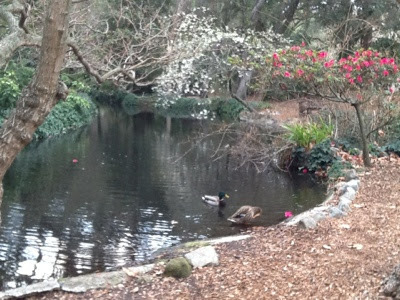 Water is a prominent feature at Descanso, whether in the Japanese garden or any of the other garden rooms. Most of my photographs here always seemed to include water even if it wasn't the focus of the shot. and admire the azaleas starting to bloom so the camellias can rest. 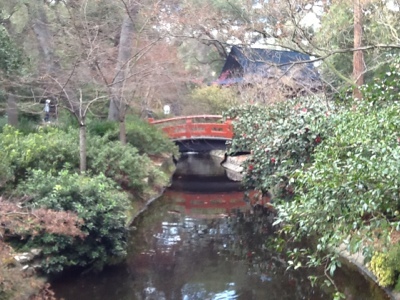 If you love camellias, you can't miss the Descanso Gardens in winter, a garden built for relaxation. 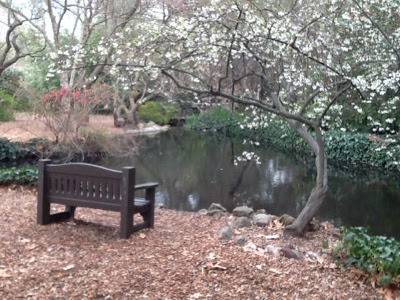 The benches are waiting for you here, but the rest is up to you. This is Garden Envy. All rights reserved. 2012. The camellias are stunning. I particularly love the red-and-white streaked ones. I have to agree, in person the red and white was the most striking! Thanks for visiting! Oh, this is beautiful! I love camellias, and would love to visit a garden full of them. 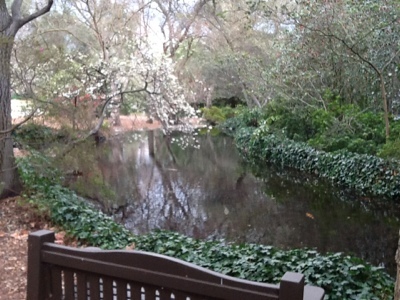 I also enjoyed the history of this garden. Amazing what one person can accomplish. I have to tell you - I have had the hardest time finding you! After you left a comment on my blog, I tried to find you, but your profile is unavailable. I finally realized how to find you by your profile name on Blotanical. Just wanted to apologize for not getting here sooner. Ah! Thank you I think I have now actually fixed the problem you noted!! www.jayro-gardenenvy.blogspot.com. Thank you for visiting! Ravie de découvrir un blog qui m'enchante par la beauté de ses photos ... Et puis, j'y découvre de magnifiques camélias: mon coeur de bretonne est sous le charme ! Merci pour votre passage dans mon petit univers ... à tout bientôt! Merci beaucoup de votre visite et pour vos aimables paroles! Je vais bientôt visiter la France et certainement l'intention de bloguer sur les jardins que je visite là-bas. S'il vous plaît visitez Envy Garden encore! São deliciosas as fotos dos jardins! Transmitem-nos uma certa paz. Há beleza e cor. Foi um prazer visitar o seu blogue. Um abraço. Muito obrigado pelas suas amáveis ​​palavras, e obrigado por sua visita! Beautiful photos! 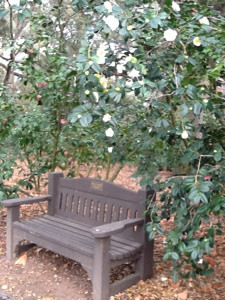 I love camellias - they are not hardy where I live, so nice to see them on your blog. Thanks for your comments and your visit! They were beautiful! !